The tumor was growing. The bigger it got, the faster it grew. And by February, it was adding about 10 pounds of mass a week. 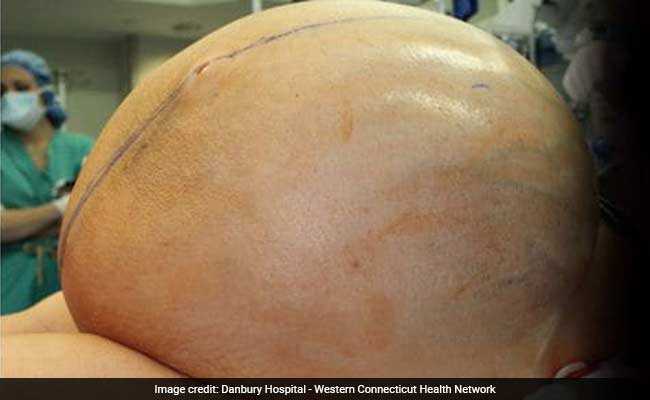 The tumor had ballooned to 132 pounds and stretched the patient's abdomen into a 3-foot-wide orb. It was the largest ovarian mucinous tumor Andikyan had ever encountered, benign only in the medical sense of the word. It didn't take the gynecologic oncologist long to recognize the growth for what it really was: A death sentence. "Without appropriate treatment, I don't think this woman would have made another couple of weeks," Andikyan, a doctor at the Western Connecticut Health Network, told The Washington Post. "She came to my office in a wheelchair accompanied by her mom and her son and I saw fear in her eyes." Andikyan and Danbury Hospital in Connecticut, where the surgery was performed, did not release the patient's name or other identifying information at her request. Every day, their patient's risk grew along with her tumor. So doctors scheduled the surgery for Feb. 14 - about two weeks after the initial consultation - and raced to plan a complex procedure in time to save the patient. Exhaustive pre-surgery planning was necessary "because there were many unknowns and hurdles to address," the hospital said in a statement. The scans could only tell the team of specialists so much, and there were myriad problems that could crop up once the patient was opened up in the specially-formatted surgical room. In two weeks, Andikyan's team had developed plans for five life-threatening scenarios. "You don't want to figure out steps on the fly," he told The Post. "It's a very difficult case, and time is of the essence if you're in a critical situation." Overseeing it all, Andikyan worried about the patient's blood circulation. The tumor rested on a major artery that pumped blood to the legs. The hospital placed a cardiothoracic surgeon on standby in case things soured. One complication cropped up early: The patient's blood pressure dropped, and had to be stabilized. Andikyan told The Post that the tumor originated in the epithelial cells lining the woman's ovary. It's called "mucinous" because the tumor cells produce a gelatinlike substance. Most such tumors are benign, but pathologists rushed to biopsy the cells and verified that it wasn't cancerous. It wasn't. And doctors had more good news: They were able to save the woman's uterus and one of her ovaries. She told doctors that she wants to have another child, and with her uterus intact, she'll be able to do so. After five hours, one of the biggest surgeries of Andikyan's career was a success. And he could see the once-fearful woman who was wheeled into an examination room getting stronger every day. "This patient was unable to walk," he said. "We needed to involve physical therapists, but a few days after the surgery, she took her first steps." 12-Year-Old Had A Part Of His Brain Removed. He Feels "Completely Normal"